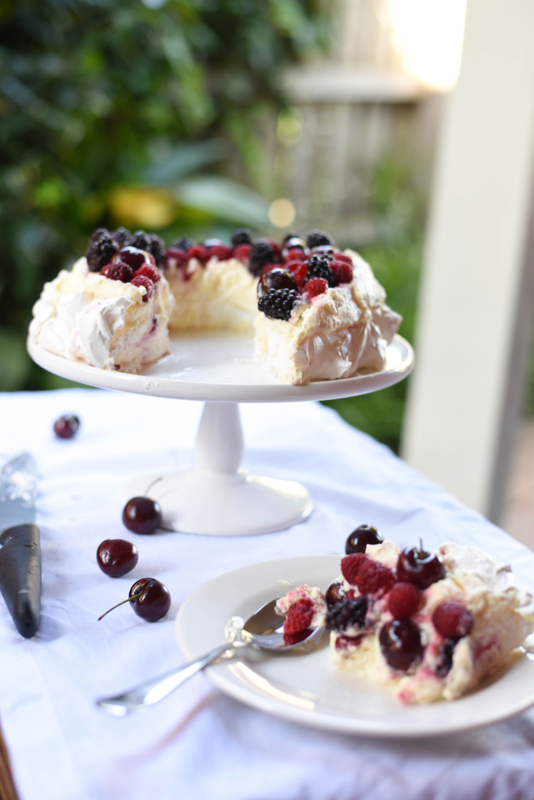 There’s nothing more Australian than a summer pavlova for dessert at Christmas. 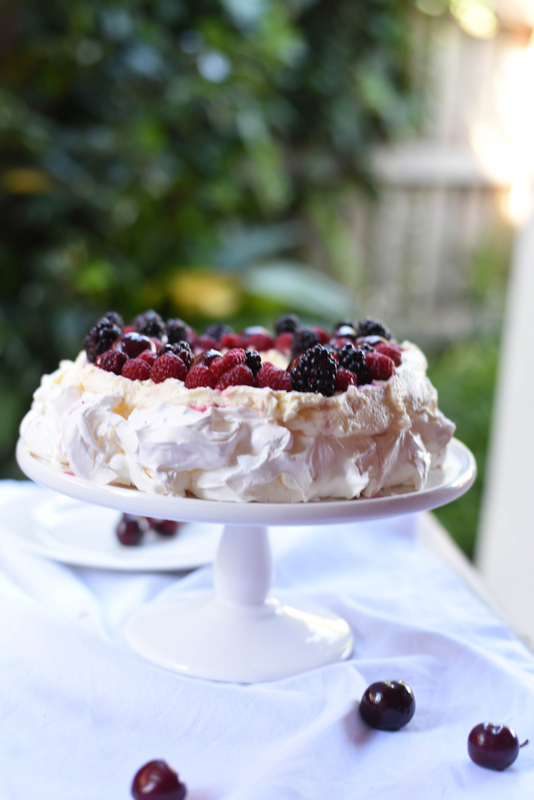 After all, what could be a better combination than meringue, whipped cream and fresh fruit on a hot summer’s day? 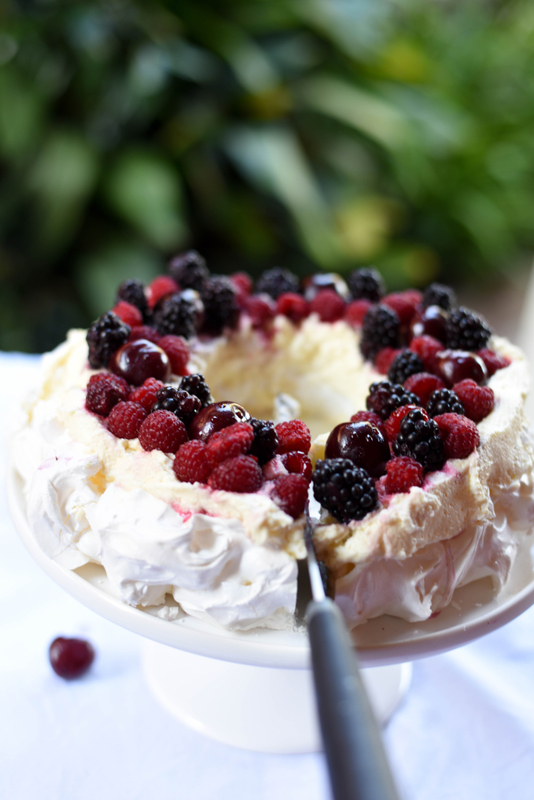 To make this pavlova even more festive, I have tried to shape the meringue into a Christmas wreath this year. Unfortunately I tried to move the meringue on to another plate, so it’s slightly sunken in the middle! 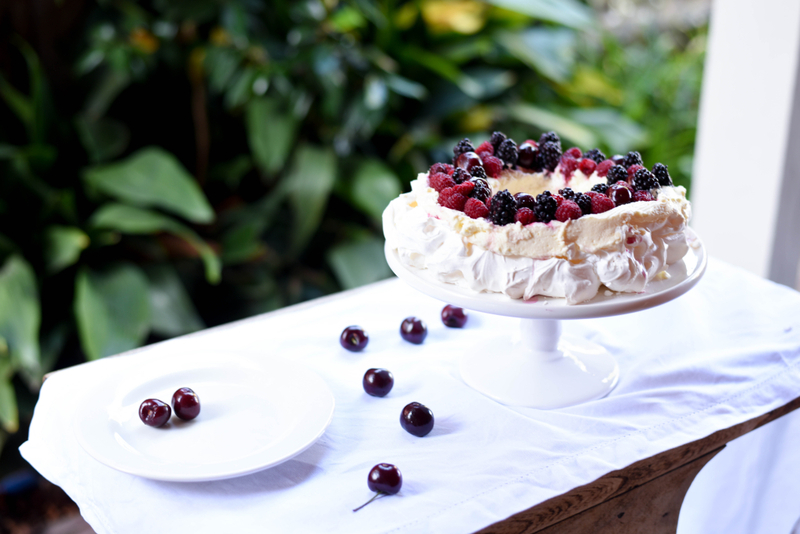 What I love the most about this Christmas Wreath Pavlova recipe is that it can be topped with just about every fruit you can think of. If you’re looking for something more tropical, top your pavlova with slices of mango and passionfruit coulis. For an extra indulgent, chocolately recipe, add a bit of cocoa powder in the meringue and a splash of nutella over the whipped cream. Pistachios and pomegranate seeds are also another beautiful addition to the cream to give it a bit more texture and added colour. If you haven’t worked with meringue much before, it can be particularly temperamental so it’s essential to get the formula right. 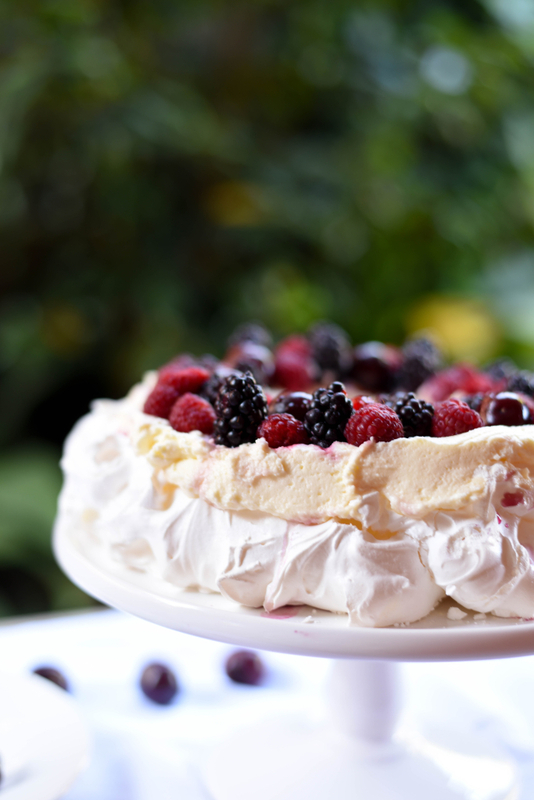 A good pavlova’s meringue should be crisp on the outside and soft and moist in the middle – almost like a marshmallow consistency. The egg whites should be beaten to a stiff consistency with hard peaks before folding in the white vinegar and corn flour. I always add a touch of sugar to the egg whites to stabilize the mixture. Also make sure the egg whites are at room temperature – this will help them “fluff up” more and add more volume. Also avoid the temptation to open the oven while the pavlova is baking. Meringue is notorious for deflating when exposed to cold air, so I like to leave it in the oven overnight, with the door left slightly ajar. 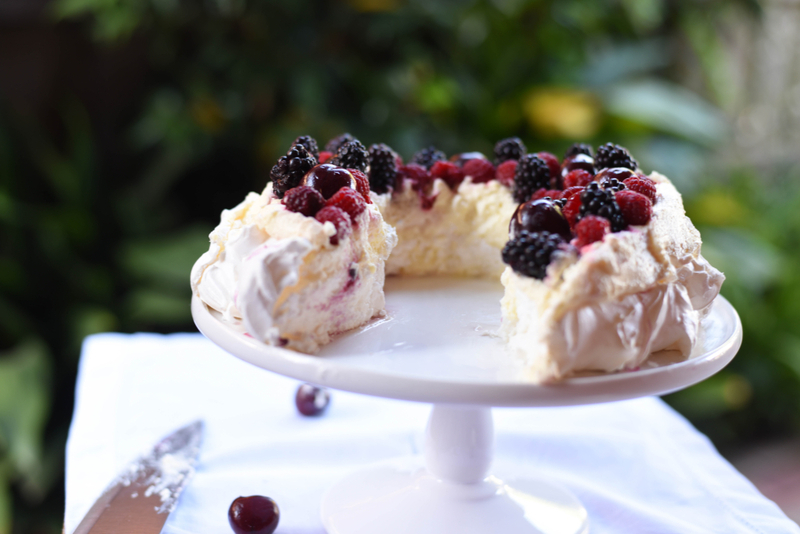 The following Christmas Wreath Pavlova recipe is adapted from My Square Frying Pans Christmas Pavlova and serves 8 – 10 people. 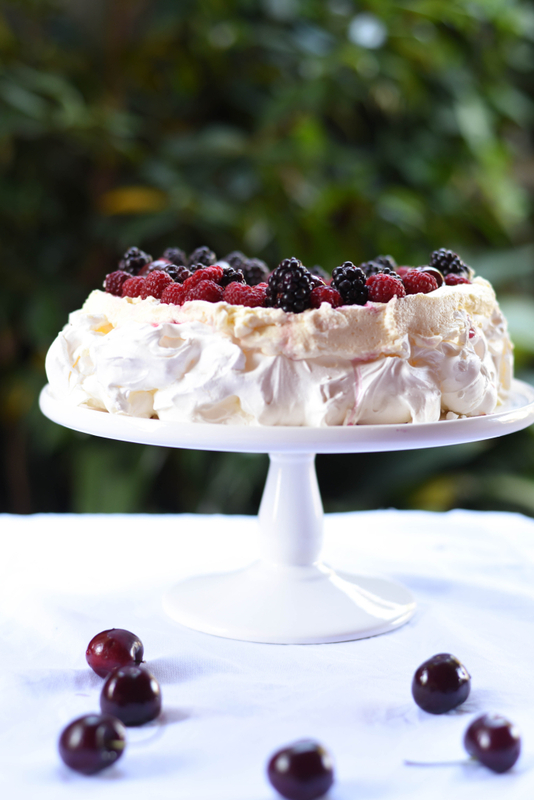 The perfect pavlova to celebrate this Christmas. Preheat oven to 120C. Line a tray with baking paper. Use a round baking tin to draw one large circle (22cm) then draw another circle inside it approximately 13cm wide. Beat egg whites, one spoon of sugar and salt until soft peaks form. Beat in the rest of the sugar, a little at a time until meringue is stiff and shiny. Sprinkle over sifted cornflour, vinegar and fold in lightly.You should be able to turn the bowl upside down at this stage with no fear of anything coming out. Grab a dessert spoon and scoop a dollop of meringue. Place this dollop between the outside and inside line. Repeat until a ring of meringue is complete. Create a second layer of meringue on top of the first until second ring is complete. Flatten the top by smoothing the meringue. Place meringue in oven for hours at 120C. When time is complete, turn off the oven and leave meringue in the oven until completely cool, preferably overnight. 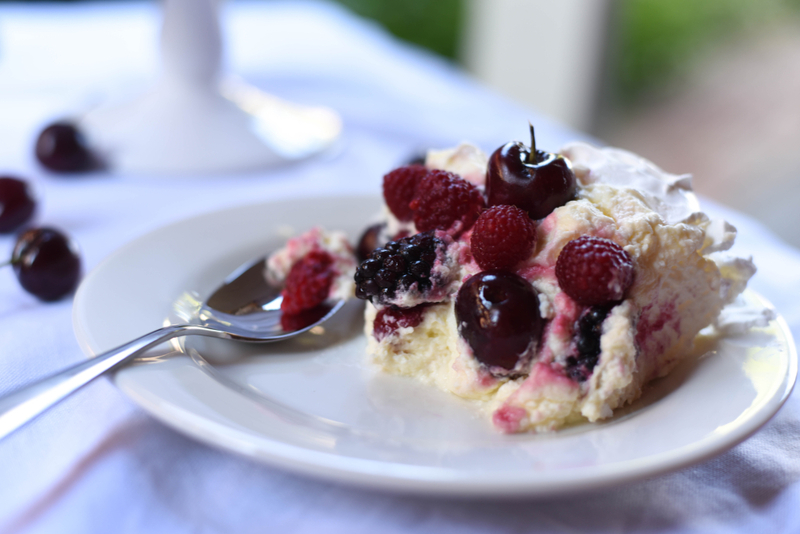 When cool, spread with whipped cream,and decorate with fresh berries and cherries.